It’s the final Swiss Round of YCS Salt Lake City! We’ve got Marcus Hayden using a Pendulum Magician Deck, but it’s a bit different from the average Magician Deck you’ll see. He’s using Number S0: Utopic ZEXAL! He’s up against Elvis Vu’s True Draco Deck. Vu must be well versed in the Pendulum Magician matchup by now, but will he be able to handle Utopic ZEXAL? It’s time to Duel! Hayden began with 2 Oafdragon Magician, Astrograph Sorcerer, Black Fang Magician, and Harmonizing Magician. He played Astrograph in his Pendulum Zone, and used its effect to Special Summon Stargazer Magician. He Normal Summoned Harmonizing, and Link Summoned Heavymetalfoes Electrumite. It put an Astrograph in his Extra Deck. He played Oafdragon, and Electrumite destroyed it to get Astrograph to his hand. He Special Summoned Astrograph and added another Oafdragon to his hand, then drew Allure of Darkness with Electrumite. He played Oafdragon and Black Fang in his Pendulum Zones, and Oafdragon put Harmonizing Magician in his hand. He Pendulum Summoned Oafdragon from his Extra Deck, and Oafdragon and Harmonizing Magician from his hand as well. Harmonizing brought Black Fang to the field. He used the Oafdragons to play Beatrice, Lady of the Eternal, sending Rank-Up-Magic Argent Chaos Force to the Graveyard. Then, he used Beatrice to play Gaia Dragon, the Thunder Charger, allowing him to add Argent Chaos Force from his Graveyard to his hand. He Xyz Summoned Number 39: Utopia, then used it with Argent Chaos Force to play Number S0: Utopic ZEXAL! In Vu’s Draw Phase Hayden used Utopic ZEXAL’s effect. Vu played Amano-Iwato and destroyed Electrumite in battle. He Set two back row cards. In the End Phase, Amano-Iwato was unable to return to the hand due to Utopic ZEXAL. Hayden drew Astrograph Sorcerer. He played Allure of Darkness to draw another Allure and Stargazer Magician, banishing Stargazer. He played the second Allure, drawing Abyss Actor – Curtain Raiser and Mythical Beast Bashilisk, banishing Curtain Raiser. He Pendulum Summoned two Astrographs. Vu flipped True King’s Return, Tributing it and Amano-Iwato for Master Peace, the True Dracoslaying King. Hayden tried to use Black Fang to weaken Master Peace, but Vu flipped Imperial Order! 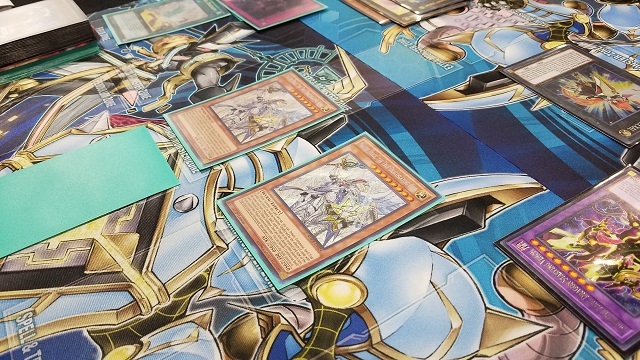 Hayden used the two Astrographs to play Odd-Eyes Absolute Dragon. In Vu’s Draw Phase, Utopic ZEXAL activated again. Master Peace attacked, but was blocked by Absolute Dragon. Hayden drew Mythical Beast Jackal King. He Tributed Absolute Dragon to Summon Jackal King, and Absolute’s effect brought Odd-Eyes Vortex Dragon to the field in Defense Position. Hayden detached the last Xyz Material from Utopic ZEXAL in Vu’s Draw Phase. Master Peace destroyed Jackal King in battle. The Life Points were 7450 to 5200 in Hayden’s favor. Hayden drew Purple Poison Magician. He Normal Summoned it and attacked Master Peace, then destroyed Imperial Order. He used Oafdragon’s effect to try getting Purple Poison back, and Master Peace responded to destroy Oafdragon. Hayden responded with Vortex Dragon’s negation effect, despite the fact that Master Peace was still unaffected by monsters. (Hayden was still able to shuffle Jackal King back into his Deck.) Hayden used Black Fang to cut Master Peace’s ATK in half, and Special Summoned another Black Fang from his Graveyard. Hayden turned all his monsters to Defense Position. Master Peace destroyed Vortex Dragon with its effect on Vu’s turn. He played Dragonic Diagram, then Set Disciples of the True Dracophoenix and destroyed it with Diagram. He added Majesty Maiden, the True Dracocaster to his hand, then flipped Terraforming to get another Diagram. He played True Draco Heritage to draw one card, then Tributed Heritage to play Majesty Maiden. He played the new Diagram, destroying another Disciples to get True Draco Apocalypse. Master Peace destroyed Black Fang, which Special Summoned Harmonizing Magician from the Graveyard. Majesty Maiden destroyed that in turn. Vu Set one to his back row. Hayden drew Supreme King Dragon Darkwurm. He Normal Summoned it and added Supreme King Gate Zero to his hand, and Majesty Maiden searched for another Master Peace for Vu. Hayden used Darkwurm and Astrograph Sorcerer to play Supreme King Dragon Starving Venom, but Vu flipped Apocalypse. He used its effect to Tribute Summon Master Peace, and destroyed Starving Venom – Hayden had no follow-up! Hayden was able to open with Utopic ZEXAL, but Vu managed to take advantage of it by keeping his Amano-Iwato in play, allowing him to make a huge Master Peace play on Hayden’s turn! That was what he needed to take control of the Duel. Hayden chose to play second. Vu began with Pot of Desires and two back row cards. Hayden began with a hand of Allure of Darkness, Oafdragon, Curtain Raiser, Mythical Beast Master Cerberus, Purple Poison Magician, and Kumongous, the Sticky String Kaiju, He played Curtain Raiser in his Pendulum Zone and Special Summoned it. He played Master Cerberus next, and used it to get Mythical Beast Jackal King to his hand. He played Allure of Darkness next, drawing Black Fang Magician and another Master Cerberus, and banished Purple Poison. He played Jackal King in his Pendulum Zone, and Vu flipped Rivalry of Warlords! Hayden attacked with Curtain Raiser for 2200 points of damage. Vu activated Disciples of the True Dracophoenix and Set another card in his back row. Hayden drew Wisdom-Eye Magician. He attacked with Curtain Raiser. Vu responded by flipping True Draco Apocalypse, destroying Disciples to weaken Curtain Raiser. Disciples destroyed Jackal King. Vu played True Draco Heritage and destroyed it with Apocalypse. Heritage destroyed Vu’s own Rivalry. That allowed him to Set his remaining cards in his back row and play Card of Demise! He then played Pot of Duality, revealing Master Peace, Terraforming, and Imperial Order. He thought a while, and took Imperial Order. He activated another Heritage and drew one card. He used Heritage to Tribute Summon Majesty Maiden, then played Terraforming to get Diagram. He Set one card in his back row and activated Diagram, ending his turn with no cards in his hand. He had Apocalypse, Majesty Maiden, Diagram, and a full back row. Hayden drew Jackal King. He Tributed Majesty Maiden to Special Summon Kumongous on Vu’s side of the field. He Normal Summoned Wisdom-Eye Magician, and Vu flipped another Rivalry of Warlords! Hayden kept Wisdom-Eye Magician on the field. 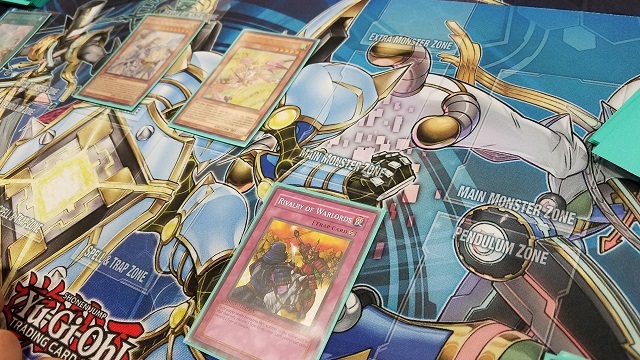 He played Oafdragon and Black Fang in his back row, and Pendulum Summoned Jackal King, sending it to battle Kumongous and destroy both monsters. Wisdom-Eye Magician attacked directly. Vu used Diagram’s effect to destroy his Set Skill Drain, getting Majesty Maiden. He used Upstart Goblin next. He Tributed Imperial Order to play Majesty Maiden, and destroyed Wisdom-Eye Magician in battle. Hayden drew Timegazer Magician. Oafdragon put Wisdom-Eye Magician back in his hand. He used Black Fang to halve the ATK of Majesty Maiden, and Maiden’s effect put Master Peace in Vu’s hand. Hayden played Timegazer Magician in his Pendulum Zone, and Pendulum Summoned Black Fang from his Extra Deck and Wisdom-Eye from his hand. He used both his monsters to Tribute Summon Master Cerberus! It attacked Majesty Maiden, which survived thanks to Diagram’s protection. Vu Tributed Apocalypse and Majesty Maiden for Master Peace, using both cards to destroy Hayden’s Master Cerberus and Oafdragon. Vu played Card of Demise. He attacked with Master Peace, then destroyed Timegazer Magician. Vu Set one to his back row to finish. Hayden drew Oafdragon. He passed with nothing on the field. Vu played Majesty Maiden on his turn, and finished off Hayden’s remaining Life Points! Elvis Vu wins, with True Draco! Top 32 Pairings with Deck Breakdown! YCS Salt Lake City: Top 32 Pairings!